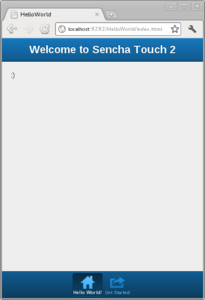 I initially thought that setting up Sencha Touch 2 to work under Linux would be pretty straightforward but it turned out to be a little cumbersome to install, what follows is a rundown of the steps that it took. Download the installer from http://www.sencha.com/products/sdk-tools/download/ , it comes in 32-bit and 64-bit. Download it from http://www.sencha.com/products/sdk-tools/download/ , there are two options, an open source version (GPLv3) and a free commercial version. Sencha does not currently provide any of the installation methods usually found in the Linux world, it offers instead an executable file that starts an installation wizard, I prefer to execute it in text mode to have a better chance of spotting any errors that might occur. Open a new terminal and check if the environment variables were set, if not add them. $ make # takes a while.. Copyright (c) 2012 Sencha Inc.
See 'sencha help COMMAND' for more information on a specific command. path.existsSync is now called `fs.existsSync`. puts "--- APP START ---"
Why Ruby on Rails is elastic?